An artist’s rendering of the proposed 50-unit workforce housing complex in Greenport. A 17-acre plot of land that has been the subject of much public debate for decades could soon become the site of 50 new affordable rental units if a project proposed by Conifer Real Estate Development is approved. Representatives from Conifer and investors CDC Long Island presented their proposal at the Dec. 19 work session of the Southold Town Board, and will be on hand to answer questions from the public Wednesday, Dec. 20 from 4 to 7 p.m. and Thursday, Dec. 21, from 9 to 11 a.m. at the town’s Peconic Lane Community Center. 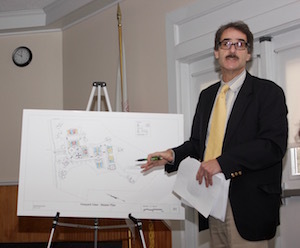 Southold Government Liaison Denis Noncarrow explained the proposal at the Southold Town Board’s Dec. 19 work session. The property, at 62600 North Road just outside of the boundary of Greenport Village, is close enough to the village to take advantage of the excess capacity in the village’s sewage treatment plant, nearby on Moore’s Lane in the village, said Southold Town Government Liaison Denis Noncarrow, who has been working with the developers on the project. Mr. Noncarrow told attendees at the work session that the housing units, which range from 686 to 1,211 square feet, would be on just seven acres of the 17-acre parcel, allowing buffers from wetlands and from Moore’s Drain, a stream that runs through the property. Conifer Vice President of Development Allen Handelman said his Rochester-based firm manages 50,000 housing units throughout the state. The company is currently in the process of building a 45-unit affordable housing complex, with preference given to artists, at the site of the former Long Island Science Museum on West Main Street in Riverhead. CDCLI President and CEO Gwen O’Shea said her firm lends to individuals, small businesses and developers to help develop workforce housing on Long Island. Southold Housing Advisory Commission chairwoman Rona Smith said the town has recognized there is a need for affordable rental housing since the last major project, ownership-based The Cottages in Mattituck, was built in 2006. 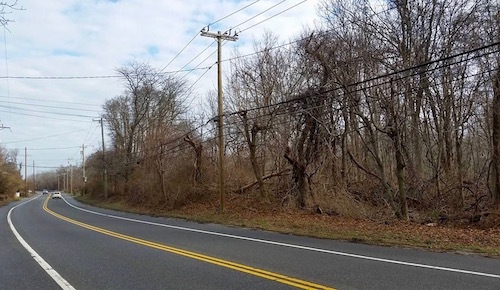 Town Supervisor Scott Russell pointed out that this property is already in a high density zoning district, and would not need to be rezoned in order for the project to be completed. The property as it looks today. The property, just east of the San Simeon by the Sound nursing and rehabilitation center, has been the subject of much concern for decades — it was once projected to be the site of a proposed 128-unit condominium complex known as Northwind Village when owned by the Kontokosta family, who had sued Southold Town to have the property annexed by Greenport Village to avoid Southold Town’s affordable housing requirements. After a decade of legal wrangling, the Greenport Village Board voted back in 2013 to no longer continue to participate in the lawsuit. With financial backing from the Kontokostas, former Greenport Village Mayor David Kapell had sued Southold in 2005 after the town turned down the village annexation request. “This has been a lightning rod, this property, for a long time. It had been the scope and scale of previous development proposals, which far exceeded what the zoning allowed,” said Town Supervisor Scott Russell at the board’s Dec. 19 work session. There are currently around 300 people on the town’s waiting list for affordable housing, he said. Ms. Smith said the developers are looking for state, federal and private funding for the project, which will be called Vineyard View, and will not be using any town money. The project will include 25 units for people who make up to 50 percent of Suffolk County Area Median Income, which ranges from $38,800 for one person to $59,850 for five people, along with 25 units for households who make up to 60 percent of area median income, which runs from $46,560 for one person to $71,820 for five people. They are anticipating beginning construction in March of 2019, with work complete by May of 2020. Mr. Russell said the need for rental apartments in Southold isn’t just limited to affordable units.